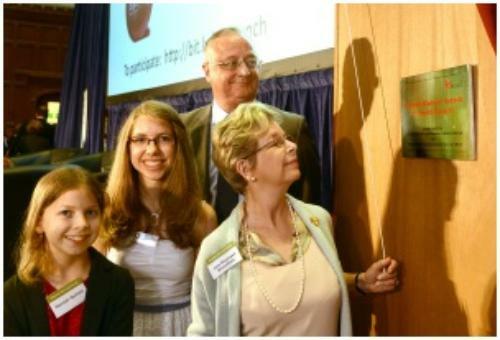 The Elizabeth Blackwell Institute was officially launched on 22 July 2013 in the Great Hall of the Wills Memorial Building at the University of Bristol at an event attended by over 700 people. We were delighted to have 14 descendants of Elizabeth Blackwell with us, who travelled from as far and wide as California, Boston and Brussels, plus members of the public, representatives of community associations and the city council, healthcare professionals, our funders and academic colleagues from Bristol and elsewhere. Professor Sir Eric Thomas, Vice Chancellor of the University, welcomed the audience and Professor Jeremy Tavaré, Director of the Institute, outlined the vision for the Institute. Jane Blackwell Bloomfield, Great Grand Niece of Elizabeth Blackwell, gave an appreciation of Elizabeth’s life as a hero who was not only a pioneer in medicine, paving the way for women to become nurses and doctors, but who also established the field of preventive medicine and hygiene before Louis Pasteur had even discovered ‘germs’, preaching the value of cleanliness, fresh air and good nourishment. The audience were then treated to a superb account of Elizabeth Blackwell’s life and work from Mary Wright, a local historian, and Sarah Blackmore, a Masters student in History at the University of Bristol. Mary described Elizabeth’s early life in Bristol and her realisation of becoming the first woman to receive a medical degree in the USA, against all the odds. 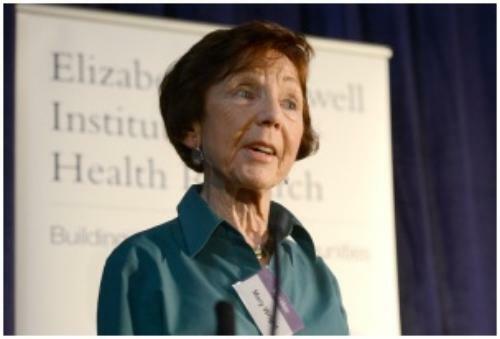 Sarah highlighted Elizabeth Blackwell’s role in founding the National Health Society and her work in improving public health in the latter half of the 19th century, especially for women, children and the poor, as well as the relevance of the National Health Society’s motto ‘Prevention is Better Than Cure’ to this day. 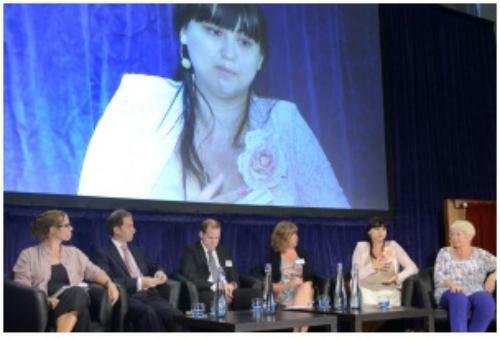 One of the first projects to take place at the Elizabeth Blackwell Institute is SPHERE (Sensor Platform for Healthcare in a Residential Environment) which is focussing on developing digital ‘home health assistants’ that would operate round the clock monitoring someone with a health condition and watching out for physical warning signs. This technology could help people with complex problems such as dementia or Parkinson's to remain in their homes where they might currently have to enter care environments such as homes or hospitals. SPHERE was presented to the audience with a panel discussion, chaired by Professor of Sciences and Society, Kathy Sykes and panel members: SPHERE Director, Professor Ian Craddock; Lecturer in Human-Computer Interaction, Dr David Coyle; Reader in Primary Health Care, Dr Sarah Purdy; Knowle West Media Centre’s Digital Projects Producer, Makala Campbell and patient Lizzy Betts. The presentation was concluded with a 'Creature Comforts'-style animation from Bristol-based Aardman Animations, which addressed some reactions of the public to this technology. The merits of the technology and its applications were then discussed through an extensive question and answer session from the audience. Finally, the Institute was formally opened by Professor Sir Eric Thomas, Jane Blackwell Bloomfield and Lucy and Hannah Quirant, Great Great Grand Nieces of Elizabeth Blackwell. The Launch and celebration of Elizabeth Blackwell’s life was covered on ITV News on 26 July 2013. 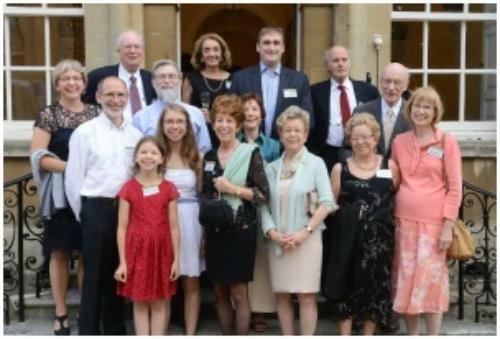 Elizabeth Blackwell family in front of the Royal Fort House, Bristol, July 2013. Bristol historian Mary Wright giving a superb account of Elizabeth Blackwell’s life. SPHERE discussion, chaired by Professor of Sciences and Society, Kathy Sykes (from left to right) and panel members: SPHERE Director, Professor Ian Craddock; Lecturer in Human-Computer Interaction, Dr David Coyle; Reader in Primary Health Care, Dr Sarah Purdy; Knowle West Media Centre’s Digital Projects Producer, Makala Campbell and patient Lizzy Betts. The Institute formal opening by Professor Sir Eric Thomas, Jane Blackwell Bloomfield and Lucy and Hannah Quirant, Great Great Grand Nieces of Elizabeth Blackwell.